6 170 km South West from Chennai and 90 km West from the former French colony of Pondicherry, the small town of Alampoondi is the location of the Gandhi Rural Rehabilitition Centre (GRRC). Created in 1983, Le GRRC is a Non-governmental organization which focuses on adults and children physically and mentally challenged from dozens of surrounding villages, through health, rehabilitation and training programs. The GRRC will be pleased to share with you its mission and its activities, welcoming and sheltering you on the spot in its 4 recently built guest-rooms. 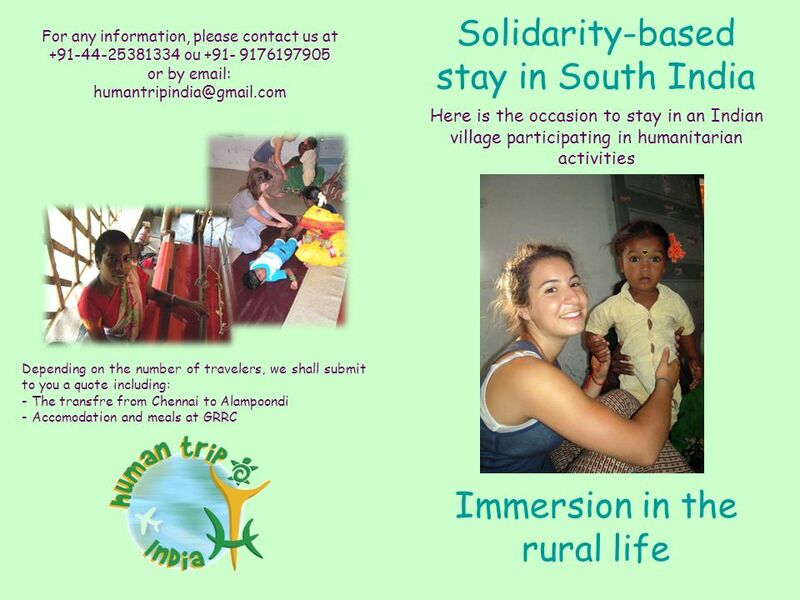 Activities Discovering the day-to-day life in the South Indian villages through a total immersion in a rural community. You will feel that the sense of hospitality among the Tamil people is far from being a legend! Discovering the local culture: beliefs, arts and traditions, cooking, etc Roaming in the ricefields and granite hills of the country. Participating in the GRRC activities: spirulina farm, natural medecine clinic, day-care centre for disable children, etc. Excursions to Gingee fort (15 km), to the holy town of Tiruvannamalai (25 km), to Pondicherry (80 km). Program DAY 1: Arrival in Chennai and transfer to the hotel by van. 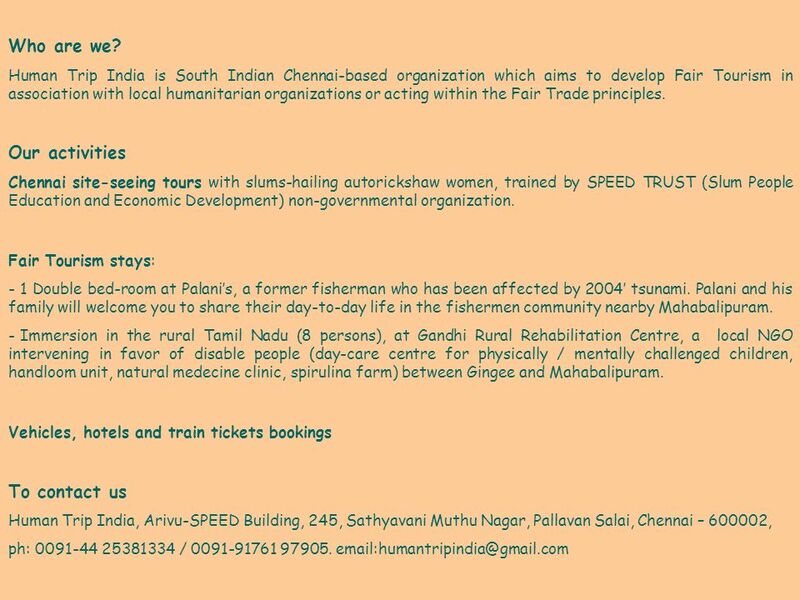 DAY 2: Visit of Chennai accompanied by female auto-rickshaw drivers trained by SPEED Trust, a social organization intervening in Chennai slums: Amethyst, Ramakrishna Temple, Fabindia, SPEED Trust, MGR Samadhi, Evening Bazaar. DAY 3: In the morning visit of Kalakshetra, a school bharathanatyam dance. Then Departure to Kanchipuram, Visit of Sri Kailashanatha & Ekambaranathar temples. Transfer to Mahabalipuram. DAY 4: Visit of Mahabalipuram: Arjuna's Penance, Rathas, shore temple. Lunch and tour of Dakshinachitra. Night fish dinner at Palani’s a local fisherman victim of tsunami . DAY 5: Departure to Pondicherry. City site-seeing: Sri Aurobindo Ashram, Ayi Mandapam, White Town, Church of Our Lady of Angels, seaside, market in the afternoon, free time in Pondicherry. 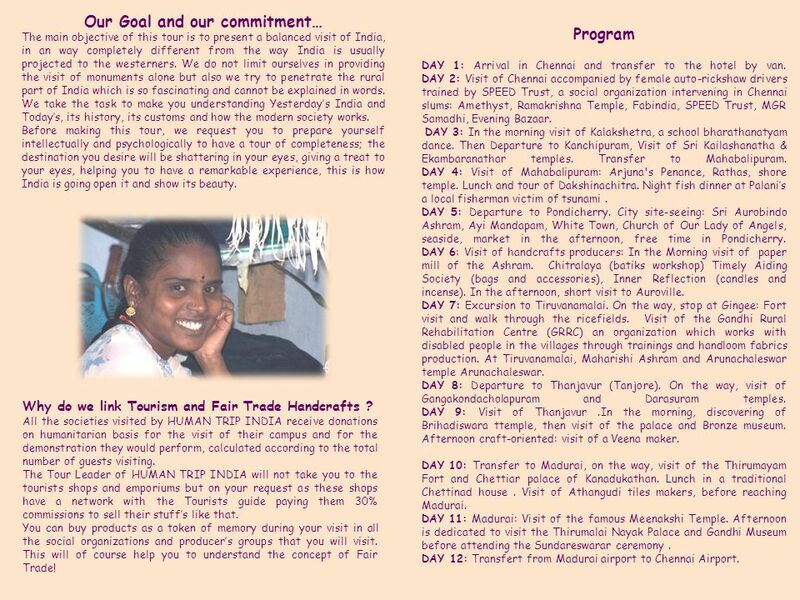 DAY 6: Visit of handcrafts producers: In the Morning visit of paper mill of the Ashram. Chitralaya (batiks workshop) Timely Aiding Society (bags and accessories), Inner Reflection (candles and incense). In the afternoon, short visit to Auroville. DAY 7: Excursion to Tiruvanamalai. On the way, stop at Gingee: Fort visit and walk through the ricefields. Visit of the Gandhi Rural Rehabilitation Centre (GRRC) an organization which works with disabled people in the villages through trainings and handloom fabrics production. At Tiruvanamalai, Maharishi Ashram and Arunachaleswar temple Arunachaleswar. DAY 8: Departure to Thanjavur (Tanjore). On the way, visit of Gangakondacholapuram and Darasuram temples. DAY 9: Visit of Thanjavur .In the morning, discovering of Brihadiswara ttemple, then visit of the palace and Bronze museum. Afternoon craft-oriented: visit of a Veena maker. DAY 10: Transfer to Madurai, on the way, visit of the Thirumayam Fort and Chettiar palace of Kanadukathan. Lunch in a traditional Chettinad house . Visit of Athangudi tiles makers, before reaching Madurai. DAY 11: Madurai: Visit of the famous Meenakshi Temple. Afternoon is dedicated to visit the Thirumalai Nayak Palace and Gandhi Museum before attending the Sundareswarar ceremony . DAY 12: Transfert from Madurai airport to Chennai Airport. Our Goal and our commitment… The main objective of this tour is to present a balanced visit of India, in an way completely different from the way India is usually projected to the westerners. We do not limit ourselves in providing the visit of monuments alone but also we try to penetrate the rural part of India which is so fascinating and cannot be explained in words. We take the task to make you understanding Yesterday’s India and Today’s, its history, its customs and how the modern society works. Before making this tour, we request you to prepare yourself intellectually and psychologically to have a tour of completeness; the destination you desire will be shattering in your eyes, giving a treat to your eyes, helping you to have a remarkable experience, this is how India is going open it and show its beauty. 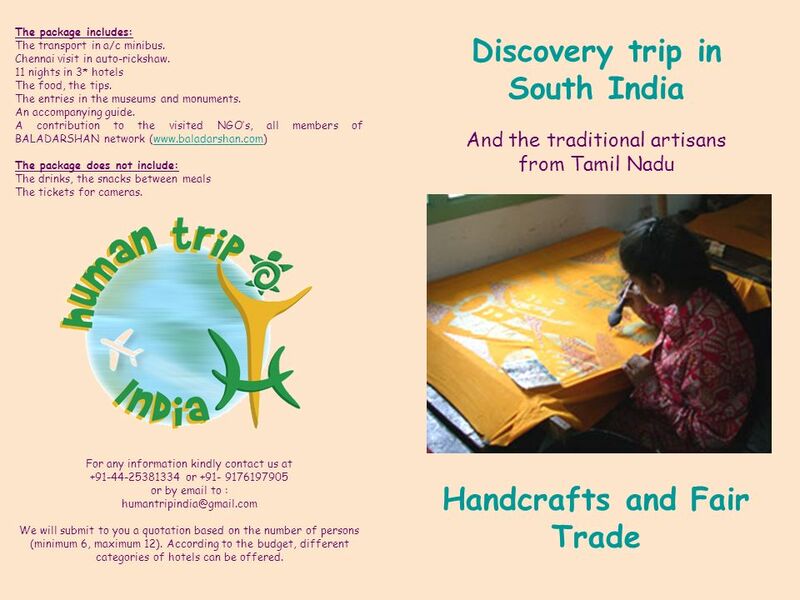 Why do we link Tourism and Fair Trade Handcrafts ? 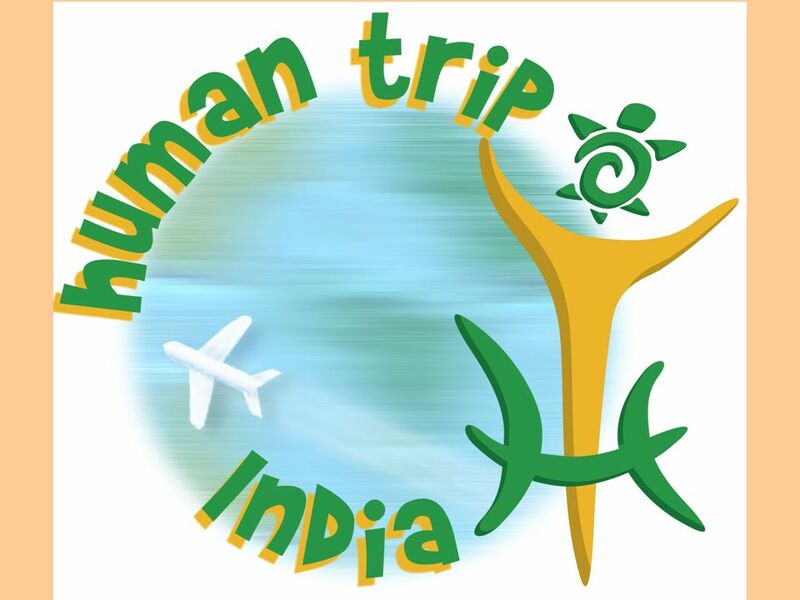 All the societies visited by HUMAN TRIP INDIA receive donations on humanitarian basis for the visit of their campus and for the demonstration they would perform, calculated according to the total number of guests visiting. The Tour Leader of HUMAN TRIP INDIA will not take you to the tourists shops and emporiums but on your request as these shops have a network with the Tourists guide paying them 30% commissions to sell their stuff’s like that. You can buy products as a token of memory during your visit in all the social organizations and producer’s groups that you will visit. This will of course help you to understand the concept of Fair Trade! Download ppt "Who are we? Our activities To contact us"
Unique Discoveries by Judy Jackson Gourmet Adventure in the South of France. Grammar focus 1.When we come back, well enjoy a show at the Sydney Opera House in the evening. 2.Once you are in Sydney, it is a must-do. Egypt Travel Mania Egypt partner for your tourism clients. We serve your Egypt travel Clients We reduce your tour operation work loads We serve with your. Thanks to the new highway, the travel time from Zagreb Airport to Opatija is now reduced to 90 minutes. Unit 2 Travelling: Tour Reservation. Step one: Warming up Duty report Review: How many X-sports do you know? What kind of X-sport do you like ? Education & Beyond (E&B) Educational trips to France To learn French…Experience France !!! ATHENS 4-DAY DELUXE PROGRAMME N.J.V. Athens Plaza 5* Sequence of tours and dinners might change depending on the final dates. Price per person in double. Agropuzzle 2 meeting in Czech Republic January 2014 Presentation Day 5. ACADEMIC TOUR WESTERN CAPE 25 APRIL – 2 MAY 2014. EMYR PROGRAM 2007 Syria 28 May – 1 June Dear friends, A warm welcome to the EMYR tours 2007 of Syria. I am available for additional comments and suggestions. Welcome to Our Itinerary. USABrazilCanadaChinaUK South Korea Chile South Africa JapanMexicoEcuadorColombia Puerto Rico Some of the countries that participated. Rwanda Office for Tourism and National Parks / Office Rwandaise Pour le Tourisme et Parcs Nationaux Presented by: Werabe Emmanuel. DC Trip Info Everything you need to know before we leave. Unique Discoveries by Judy Jackson Vienna, Austria. LESOVO – CHALET ”TUNDZHA” - SREM – ELHOVO – YAMBOL– VESELINOVO – KABYLE OPPORTUNITY FOR REST, HUNTING AND WALK ALONG THE RIVER. Plenary Holidays Private Limited New Delhi | | Student Group – Uttarakhand-North India. EUROPEAN FANTASY 15 DAYS & 13 NIGHTS. COUNTRIES Spain France Luxembourg Germany.